The efforts of travel firms and HCM City’s authorities have helped the local tourism sector maintain its growth trend despite declines in the number of tourist arrivals to Vietnam this year. 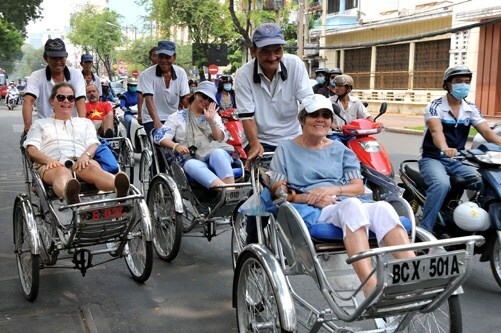 Local travel agencies have recently launched a wide range of new services that meet tourists’ tastes and win their favour, including a city tour by bike and another tour discovering Nhieu Loc-Thi Nghe canal. The city organised and planned to hold a number of promotion activities this year, including an Ao Dai (traditional long dress) festival in March, a southern food festival in May, a southern fruits festival in June, an international travel expo in September and an international delicious dishes festival in December. In addition, promotion activities were also organised in Australia , Japan , the Republic of Korea , Russia , Eastern Europe and Indonesia . HCM City is improving and standardising tourism service quality via a programme to select the city’s 100 interesting things, which aims to discover quality cultural values, cuisine and tourism services to be introduced to tourists. Many tourism publications such as an English-language book on the city’s tourism and a city map. Besides, the website of the HCM City Department of Tourism and the call centre 1087 were established to help tourists explore the city. Historic sites, old architecture, museums, festivals, traditional culture and flower villages are being renovated to ensure the city’s sustainable tourism growth. HCM City is also cooperating with eight provinces in the north to develop tourism. HCM City boasts 144 natural and cultural heritages and tourist sites, and plays an important role in the country’s tourism development. It is now the largest tourism hub of the country, attracting 70 percent of the total tourist arrivals. In 2014, the city welcomed 22 million tourists, including 4.4 million foreigners, earning more than 86 trillion VND (3.9 billion USD) in revenue. In the first eight months of 2015, 2.83 million foreigners visited the city, a year-on-year increase of 5 percent. It earned over 60.7 trillion VND (2.76 billion USD) from tourism activities during the period, up 4 percent year-on-year.